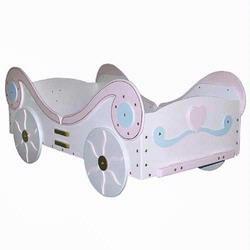 Every little girl is a princess, and every little princess must have a carriage to take her to slumber land. A standard sized crib mattress fits this princess toddler bed. All wood construction - hand crafted from imported laminated and other solid woods. The Bed measures 29 x 53 inches. The entrance is 12 - 13 inches above the floor.